In the lifetime of a house, there is a time when a person considers breathing new life in a home through a repaint. Check around the outside of your home for some of the telltale signs that your home is due for a fresh coat of paint. The usual time that a house needs to be repainted is every 20 years or so. Wood siding should be repainted every three to seven years, metal siding needs to be repainted every five years, cement sidings should be check up every ten to 15 years, and brick siding that has been painted should be looked after every 15 to 20 years. A few warning signs to look out for is peeling paint, cracking on the paint surface, and wood rot on the portions of the siding where the paint is absent. Here are some tips from the team of painters at PL Mountzoures with what what you can expect when painting your house exterior. Are You Going with a Pro or DIY? Going with a professional, you have the safety net of having an estimate of the price and time for the overall project. That includes the supplies used to do the painting job itself, plans for protecting the surrounding property and the timeline need to complete the task. The speed that comes with someone familiar with the craft, and the assurance of quality that comes with hiring a pro for the job. With a DIY approach, the time frame is looser as you set the pace of the project. It can be a rewarding challenge to paint your house, but there is the quality of the work and your safety to keep in mind. There is climbing tall ladders, maneuvering around roofs and windows, and knowing which areas to paint and which areas to avoid painting to prevent mold growth. Ensure that the weather you'll be painting in is favorable. This is, so the paint has enough time to set and go through the drying process correctly. Most paint won't dry in temperatures lower than 50 degrees, but there are options available for colder climates that dry in cooler temperatures. The inverse is also true where too much direct sunlight or heat that causes paint to dry too fast causing lap marks. Check your paint manufacturer's recommendations and temperature rating so that you can avoid any application issues. Plan to use a type of paint that can handle the brunt of your climate has to offer. Areas that get lots of sunlight and are in hot or dry climates need a paint that can resist cracking and fading. Warm regions with high humidity need a paint that is resistant to mildew while homes in desert climates need a paint that blocks dirt. If you are hiring a painting contractor for the job, then you have to take into account the quality of the paint that they are using. Lower quality or the wrong type of paint will not be able to stand up against the elements and age faster. They may require a touch-up or even a whole repaint down the line earlier than expected. An important thing to know is what your home owner's association allows in regards to exterior home modifications. Paint counts as a modification. You can do this by submitting the proper paperwork of your project along with the color swatches for your new color. Then wait for the green light. Getting permission and then painting once is better than having to spend more money repainting your house to appease the HOA. If you are in an area that doesn't have an HOA in place, then there might be state building codes in place that you will have to consult before you paint. If you are going to be a DIY warrior then taking stock of your available colors is going to be your first step. If you aren't buying a new batch of paint for the project, then you need to take stock of your inventory of paint. The years in storage may have caused variations in your old paints that may have caused different shades and tones to form. If age has affected your selection or your purchased paint from different stores or locations, then there is a solution to fix your colors. You can mix the different paints in a large bucket or container to homogenize the hue into one consistent color and use that for your project. 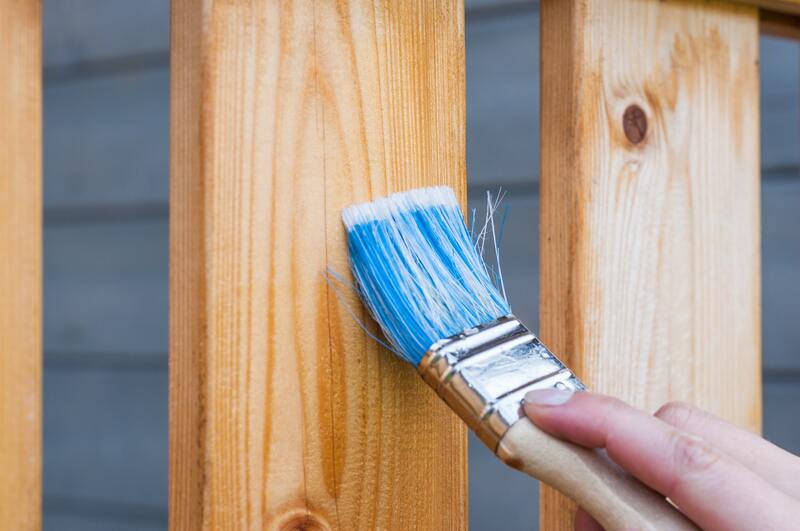 Paint bonds best to clean and dry surfaces, so washing the original siding and trim will help your paint adheres. When painting on unpainted wood using a primer can help your new paint adhere better. Clear your area of any obstacles like grills or chairs as when you apply the first stroke you are in a race against time. Lay down tarps to protect any decking or walkways from stray droplets. There are three major types of paints available for painting the exterior of a home. Knowing what works best with your goals or styles and what their drawbacks can help you plan better. -The number one choice for many. This type of paint comes in a wide range of colors finishes (Flat, Oil-based, Stain). Flat works well indoors with its matte texture but doesn't fare well outdoors due to its durability. Satin has a good sheen to it and that works well with wood siding and offers better protection. Semi-gloss has the most protection and for that has found its way to be being used on windows and trim for that fact. All of these finishes share the traits of being able to clean with water, and handling temperature fluctuation well. A drawback of acrylic latex paint is the fumes that it lets off during application and drying process are very irritating and can even be toxic without proper circulation. -A durable paint that once was the standard in interior and exterior uses but has lost favor due to acrylic's popularity. Still an option in today's market as a viable paint type. The appeal of oil-based paint is that over time it will harden and gain even more protection, which is why it gained use on handrails and walkways. However, a negative of that value is that the paint itself can become brittle with exposure and achieve a cracked texture. Also in its application, oil-based paints can't be applied on latex paints as it will not adhere to the base layer properly. -This type of paint highlights the natural textures and shine in wood and helps to protect them from the outside elements. Exterior stains aren't as protective as paint because sunlight and weathering can still bypass the stain and affect the underlying wood. Being a forgiving type, stains don't need that much time dedicated to prepping the site you intend to apply them. You only need to wash and remove any existing stain on the area. There are different finishes of stains that vary in the amount of underlying wood you can see and the protection that they offer, but the choice you make is up to personal preference. With these tips, you are prepared to paint, whether you were planning to or that you found out that your home needs a new coat. If you have any questions about roofing or would like to have out team of contractors to come out for an estimate, contact us at (860)-434-9540.